There are tourist information centers in the airports, but one rarely finds such conveniences in other locales. Bangladesh has a number of agencies that specialize in tourism, and there are shuttles from the airports to take travelers to these agencies to gather more information on tours, bus trips and sightseeing. Hotels often have maps of the country and information regarding sites of interest. City maps are not common. When one is trying to find an address, it is not only acceptable but often necessary to ask directions on the street. When doing so, it is best to first address the person courteously, calling him "bhai" (pronounced "pie") meaning brother, or, when asking a woman, calling her "apa" meaning sister. In this way, one indicates a desire to show respect and to make a deeper connection with the other person and his/her world. The cities tend to be divided into quarters, and streets are often unmarked. A traveler should always get the complete address for a destination, paying particular attention to the name of the quarter. It is often necessary to ask a passerby for directions, and, when the street name is not familiar, one can always mention the name of the household. Commercial sections are usually more clearly marked, but schools and hospitals tend to be in less well marked, residential neighborhoods. Traveling from city to city is simple since there is usually only one possible route. 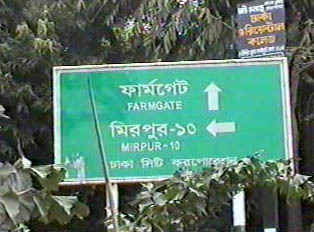 Road signs are only in Bangla, so it is necessary for foreigners to get specific instructions about which exit to take. "Which way is the Abahani Field?"